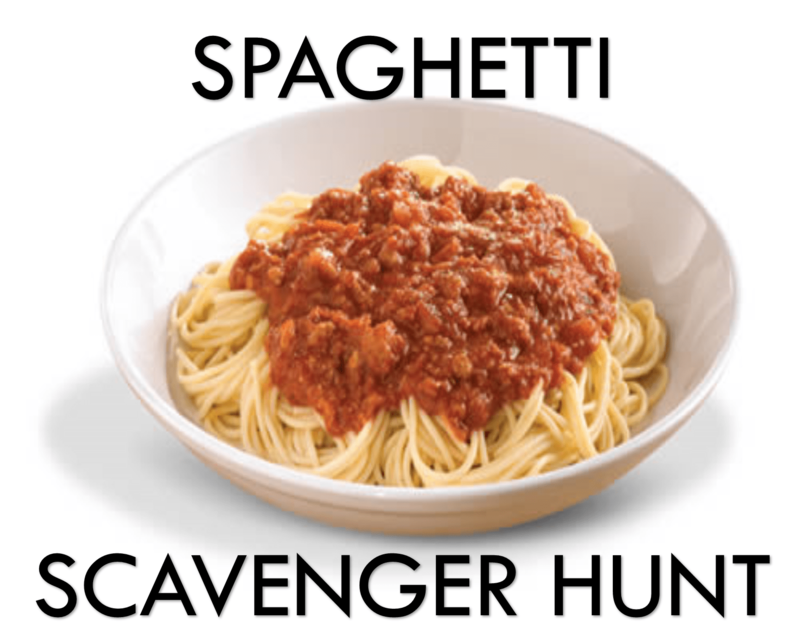 Spaghetti Scavenger Hunt is a simple game that gets a little messy, but provides a whole lot of fun! Spaghetti Scavenger Hunt requires a bit of prep work. You will need a minimum of two pounds of cooked spaghetti noodles per participant (more is usually better). Since cooking noodles can take a little while, we recommend that you have a leader or parent cook them for you and simply bring them in Ziploc bags. This will save you time and money while allowing you to focus on the game setup. Once you have all your items, throw them place each participants spaghetti on a large plate, mix in the items and pour some spaghetti sauce over the top. Place the 4 plates on a table (have this done beforehand, this way you can just bring the table out while you are selecting participants) along with the 4 small bowls. Explain to the contestants that they will need to find as many items in the spaghetti noodles using only their mouth within 90 seconds. Once time is up, you will tally the items and declare a winner. If you would like to assign point values to each item, you can also let them know what those are at this time. Whoever comes up with the most items (or points) is declared the winner and awarded the winner of the great Spaghetti Scavenger Hunt! 1. If you’re looking for candy items, just hit up the bulk section at a local grocery store. You’ll save some money and avoid spending time looking up and down the candy aisle for ideas. 2. Elevate your participants. If they are playing on a table, try to get them up on a stage or platform so everyone can easily see what is going on. 3. Take lots of pictures! Take some before, during and after. If you have bibs to throw on the participants, it’s a great touch for your photo op. 4. Have fun music in the background. Use something current and upbeat. 5. Award a prize. Whether it’s a gift card to a spaghetti place or a jar of sauce, let the winner walk away with something to remember their victory by.